Our company sells omamori of Buddhist temples and Shinto shrines. The omamori come predominantly from the area of Kansai, which includes the prefectures of Kyoto, Osaka and Nara. We have in store also omamori of temples and shrines of other Japanese areas. 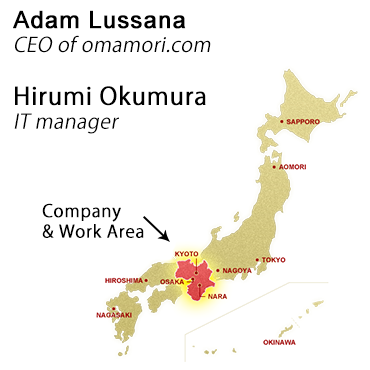 The headquarters is located in the prefecture of Nara. Our staff consists of eight people and is able to communicate with customers in japanese, english, spanish, french and italian. We have thousands of customers all over the world in all continents. We thank them because they are our best advertising. *** The percentage of sales refers to the previous year.